StratiQuilt™ Double Faced Barrier Blanket combines BlockAid® sound blocking material with absorption to control reverberant energy and handle tough noise problems. Use this material as a semi-flexible barrier enclosure to create sound proof areas. 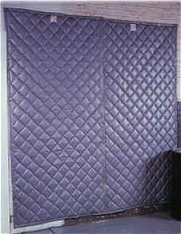 This quilted fiberglass material is available in standard panels or in rolls for fabrication in the field. Construction: Two layers of 1” thick, 2 lb./cu.ft density fiberglass batting, quilted between two layers of aluminum-vinyl coated fiberglass facing material. Contains 1 lb./sq.ft. BlockAid® vinyl barrier septum. All panels have standard brass grommets 12" O.C. on top hanging side. Standard panels are available in widths up to 4' and in standard heights of 4', 6', 8' and 10'. Chemical Resistivity: Resists oils, grease, moisture, mild acids and alkalis, dirt, dust, and salt atmospheres. Facing can be steam cleaned or washed with common industrial cleaners. Temperature Limits: Service range of -20° to 180°F (continuous). Weight: 1.50 lb./sq.ft. ; 216 oz./sq. yd.